What a joy it is to be constantly dealing with new images of art in our digital collection! I’ve already directed you to our new collection of trade cards from the Winterthur Museum. Now I want to show you something from the Mint Museum in North Carolina. 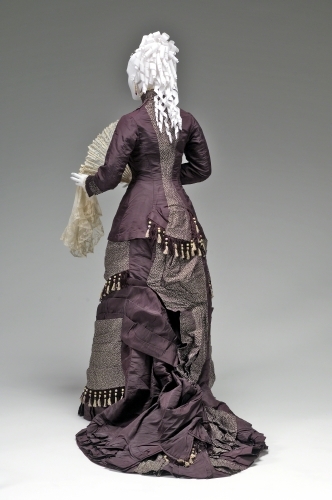 I’m always ecstatic to see works I’ve never paid enough attention to before, such as this gorgeous “afternoon” frock. I’ve said it before and I’ll say it again: I don’t feel there’s ever been a time in [art] history when women didn’t play a significant role. New acquisitions from the Mint Museum, as well as the American Antiquarian Society, emphasize this. 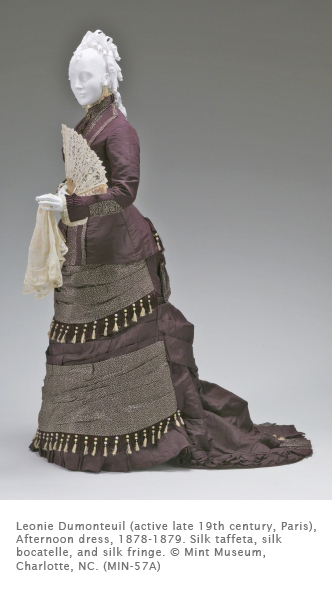 Leonie Dumonteuil had her own fashion “house” (Maison Dumonteuil) in Paris, which means that she was a successful designer and businessperson. The same designers who pioneered the crinoline (hoop skirt—see Gone with the Wind), pioneered the bustle, a tamed down version of the crinoline. Actually, the bustle was a wire cage with padding that was collapsible for sitting. The designation of this “frock” as an “afternoon dress” indicates that it was meant for wealthy women who changed outfits to suit the time of day. Obviously, it wasn’t for a woman who had to go shopping for groceries or do the laundry, but rather for one who entertained visitors in the afternoon. Although some trade cards would lead one to believe that middle class women sported bustles in their homes during domestic duty. While fashion design might seem like a stereotype of women artists, it underlines the fact that women were hard at work during a century that persistently demanded that women be tied to the household. I’ve already shown you how women artists pioneered “art pottery” in the 1800s. That, however, was not the only field in which they were active. Women artists could be found working in many art forms, including painting, sculpture, and architecture. They were the backbone of the booming printmaking genre that made the 1800s one of the most prolific advertising eras in history. 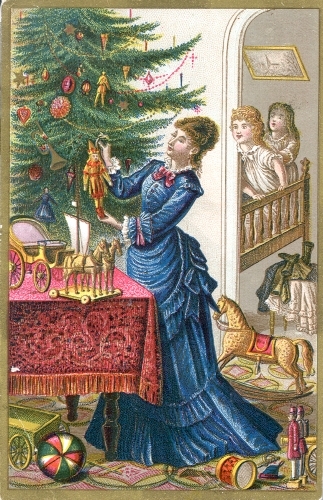 Not to mention Currier and Ives, which employed women to hand color their lithographs. 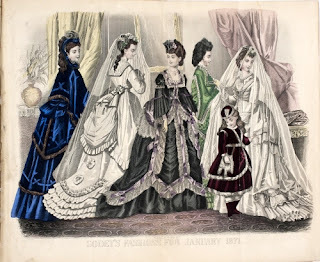 Godey’s Lady’s Book employed a “corp of one hundred and fifty women” who hand colored their monthly fashion plates. By the 1850s, Godey’s had a circulation of 150,000, which means these artists were working big time to hand color the fashion illustrations. Aside from Frances Flora Palmer (1812–1876), who did landscape drawings for Currier and Ives, very few, if any, of these women artists are known by name. This lovely print, probably copied from a French fashion journal, features the bustle at its greatest extent. I’ve seen wedding dresses like this on Say Yes to the Dress on TLC! Oh, and, by the way, consult an earlier blog post to see when white wedding dresses became fashionable. Studio activity: Pretend that you are a fashion designer from the 1870s and design a dress with a bustle, using color pencils or markers. Update the style by adding touches that are totally 21st century, such as iPhones, iPads, synthetic materials such as Plexiglas, or technology such as wiring and DVDs.